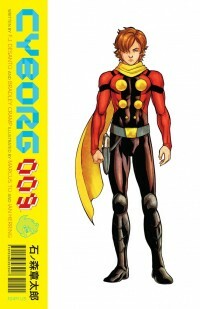 Archaia Entertainment has updated Shotaro Ishinomori‘s manga about a multicultural group of cyborg outcasts, Cyborg 009. A young man known only as Cyborg 009 wakes up in a top-secret research facility. He has no memory of his previous life. He is immediately told to destroy his predecessors Cyborgs 001-008. Eventually, the cyborgs escape along with Dr. Gilmore, one of the more sympathetic scientists involved in the cyborg soldier project. Cyborg 009 learns about his origin and the origins of the other 8 cyborgs. Most of them were randomly kidnapped and they have very diverse ethnic and cultural backgrounds. He has a bit of a rival in the group in the New-York born Jet Link, and a potential love interest in the French-born Francoise Arnoul. Cyborg 009 has to deal with an emotional tug-of-war between a longing for his old life, and the pressing need to unite with his cyborg brethren against Sekar, the villainous leader of the group that turned them all into cyborgs. 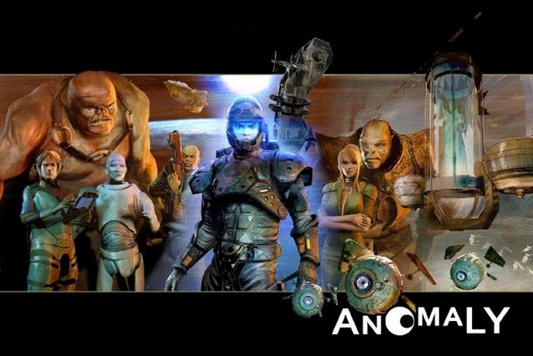 Anomaly is a massive, awesome graphic novel that takes place in a future where most of the nations on Earth have joined together as one entity called The Conglomerate. 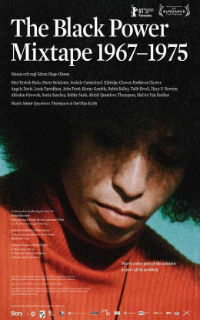 The Conglomerate is eagerly trying to take over worlds and spread their influence. The story begins with an ex-enforcer for the Conglomerate named Jon. Jon disobeyed orders in combat and got demoted to a low-level worker, or a menial. 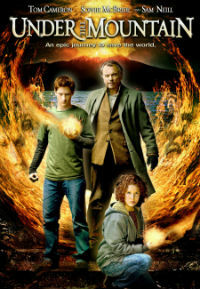 Jon is given an opportunity to redeem himself when he is reinstated as an enforcer and ordered to accompany Sam, the daughter of a high-ranking Conglomerate member, on an interplanetary mission of “peace.” However, once they land on the plane that they named Anomaly, their peace mission turns out to be a suicide run. The atmosphere of the planet destroys most of their technology and the crew members find themselves in the middle of centuries-old conflict between several alien races. The would-be explorers are now fighting a desperate battle for survival. 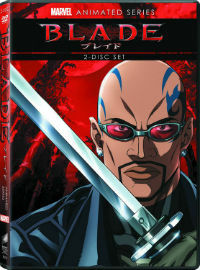 Marvel Anime: Blade is the last of the first wave of Marvel DVD releases of anime versions of their characters produced by Japanese animation company Madhouse. These anime series aired in Japan originally, were dubbed in English, aired on G4, and were then collected on DVD and Blu-ray. Blade is Eric Brooks, a half-human, half-vampire hybrid known as “The Daywalker” because sunlight does not affect him. While Blade’s mom was pregnant with him, she was attacked by the vampire Deacon Frost, resulting in Blade’s unique nature. Blade struggled to control his bloodlust until he met Noah Van Helsing, an old vampire slayer. He taught Blade to control his urges and Blade began training and traveling the world, vowing revenge on Deacon Frost and seeking the destruction of the vampire race. The Dare! Detectives are a trio of ‘defective detectives’ operating out of Enderby City. Maria is a tattooed ‘bad girl’ with a chip on her shoulder, Toby is a dim-witted strongman, and Jojo is a bunny with an attitude. When the story begins, they’re chasing notorious criminal Furious George, a very bad monkey. The chase does not end well, and they end up having their detective license suspended. While sitting at their landlord Uncle Chan’s restaurant trying to figure out a way to pay the rent, they stumble upon a new criminal operation led by the Madame Bleu and and her angry panda bears. 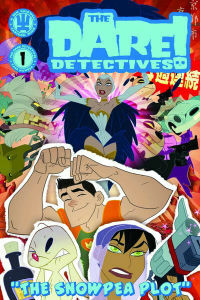 Uncle Chan is kidnapped, Madame Bleu and her pandas escape, and the Dare! Detectives are on the case again. 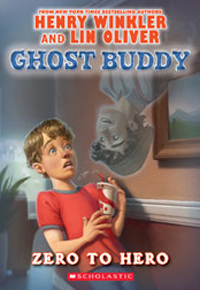 Have you ever wondered about the habits and daily lives of monsters? Would you be surprised to learn that they engage in mundane activities just like the rest of us? Writer/artist Super Ugly has spilled the beans and given us an inside look at the everyday lives of monsters. 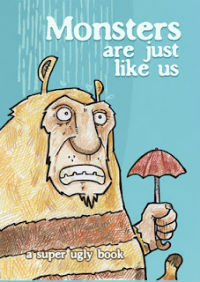 Through the efforts of Super Ugly, we learn that Monsters Are Just Like Us. Monsters alternates between pages with text and hilarious pictures telling us things like “They never clear a paper jam, just like you!” and “They think ‘double-decaf, non-fat, no foam latte’ is coffee just like you!” My personal favorite is “They sing along with Miley Cyrus in the shower, just like you!” Unlike most books that show monsters rampaging and frightening people, Super Ugly shows monsters at work, at home, and at play. 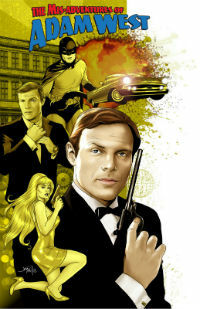 The Zombies Vs. Robots comics were one of the first big hits for IDW Publishing. Naturally, they continued the story with mores miniseries with Zombies vs. Robots vs. Amazons, and then Zombies vs. Robots Aventure and ZvR: UnderCity. In UnderCity, the character of Pammi Shaw is introduced. 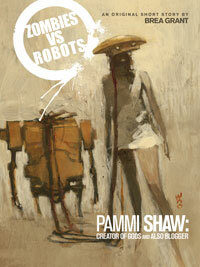 She is also the “author” of the blog entries that comprise this short story, Zombies vs. Robots: Pammi Shaw: Creator of Gods and Also Blogger.